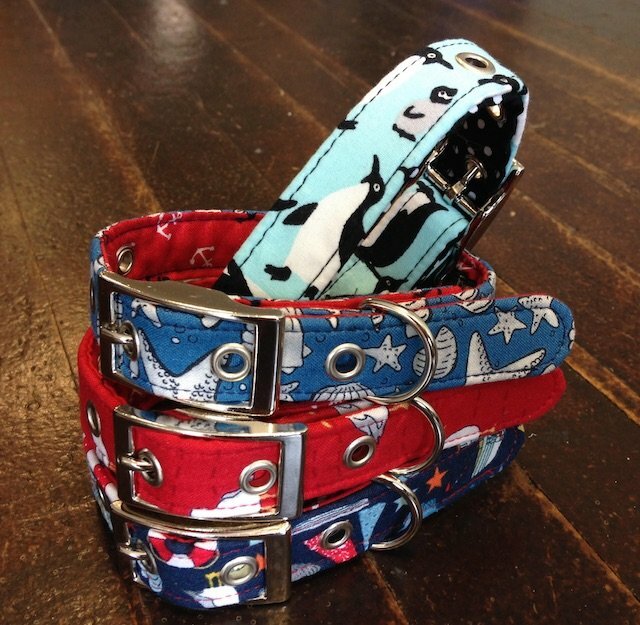 Hot off the design tables at BlossomCo is our new collection of super stylish coastal design dog collars. The BlossomCo Coastal Collection is a fabulous set of designs inspired by elements of the sea, sand, beaches, seaside towns and all that reminds us of time spent on the coast. From sea shells and starfish, to lighthouses, sea gulls, anchors and the quayside, these designs evoke imagery of lazy days spent in and around the coast. 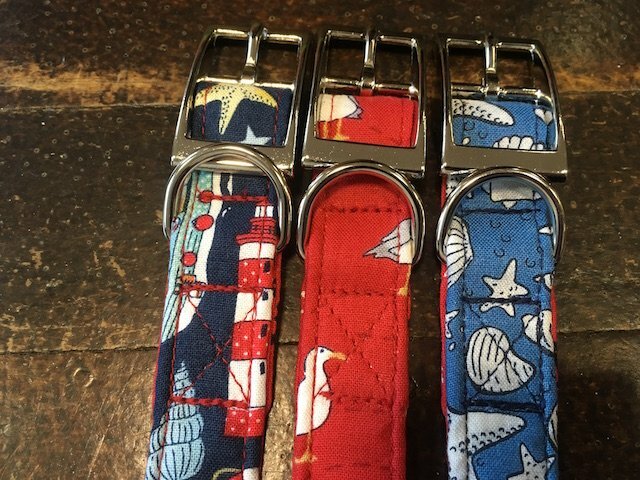 Whether it’s ambling along the quayside, running along the beach, standing proudly at the bow of a boat with ears, tongue and tail wagging in the sea breeze, or just curled up in a seaside cafe or Inn watching the waves roll in, BlossomCo’s coastal designs of dog collars and leads are a great addition to any dog’s seaside wardrobe! Available in three sizes of collar and with a matching lead available for each design – what better way for your dog to be dressed. Matching dog bandanas in each of the coastal designs are also available to fully complete the sea-dog look! And for those who might like something a little different, the fourth design in the coastal collection is our Penguin design – seen here sitting atop the other three designs – with enough penguins to almost make a colony on every collar! 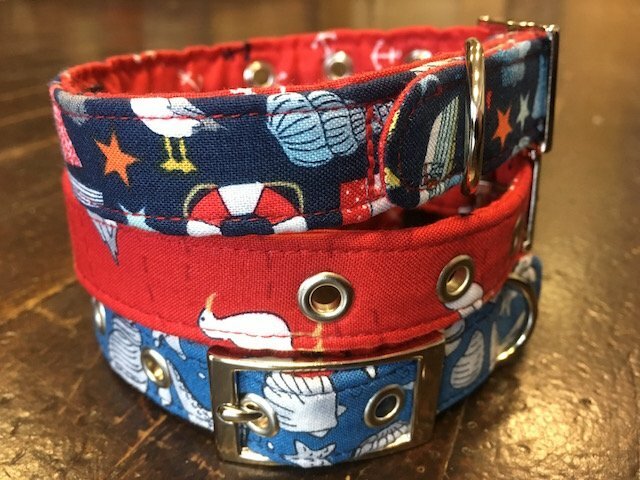 The Coastal designs can be found here on our products page along with all our other current designs of handmade dog collars, leads and bandanas. All BlossomCo products are proudly handmade in England by our own seamstresses. Is everyone in your family ready for their Summer Holidays? You may be all packed up – but have you packed for the four legged member of the family yet? Some of us dream about lying by the pool with a cocktail close to hand. Others of having time to read a book. To be included in the family holiday, wherever it may be. This year Freddie is coming to Devon with us. Freddie longs to have her own little suitcase and pack like a pro. As a treat, we arranged for her to spend a morning with a packing guru. Following her masterclass we think she has pulled it off. 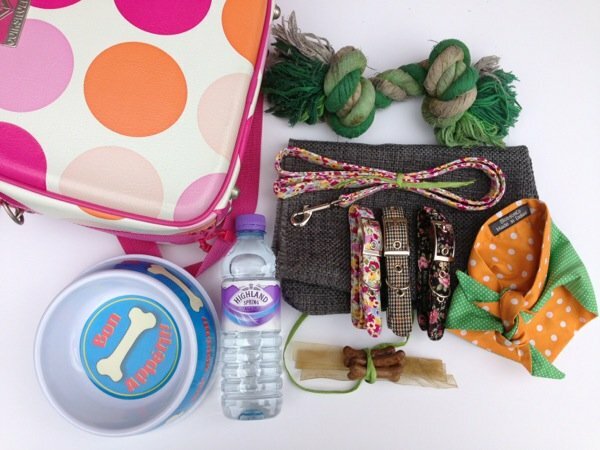 Freddie has the best doggy holiday suitcase this summer! 4 Tweed Collar – A must for Sunday morning brunch by the harbour in Dartmouth. Freddie decided to keep her options open and packed both. 6 Favourite toy – What’s a dog supposed to do while her owner’s washing her hair? 7 Well, everyone needs treats don’t they?